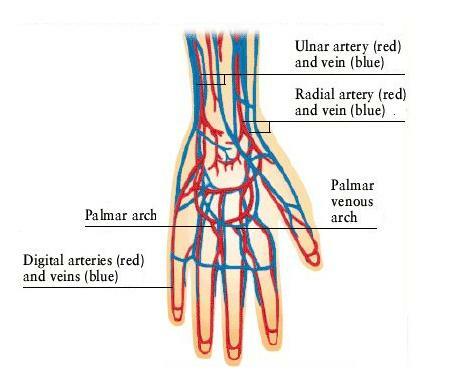 THE BLOOD VESSELS IN THIS PART OF YOUR BODY LIE VERY CLOSE TO THE SURFACE OF THE SKIN. YOU CAN SEE THEM ON THE BACK OF YOUR HAND AND ON THE INSIDE OF YOUR WRIST. SOMETIMES THEY BULGE IN THIS AREA WHEN YOU ARE HOT OR DURING EXERCISE,WHEN YOUR HEART IS PUMPING BLOOD RAPIDLY AROUND YOUR BODY.